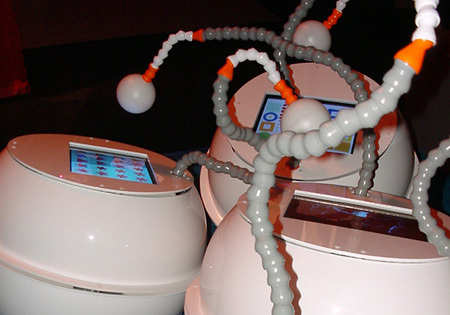 The Introspection Machine is an interactive visual feedback environment. The machine consists of multiple modules, each of which has a screen display and a flexible, manipulable 'eyestalk.' Each module transforms the video image from its eyestalk into a dynamic display. The software module I wrote for the IM (shown in the rear of the above image) was inspired by the idea of creating a reactive aperture. The Introspection Machine was created by the Aesthetics + Computation Group at the MIT Media Laboratory. For more information about the Introspection Machine, visit the website.